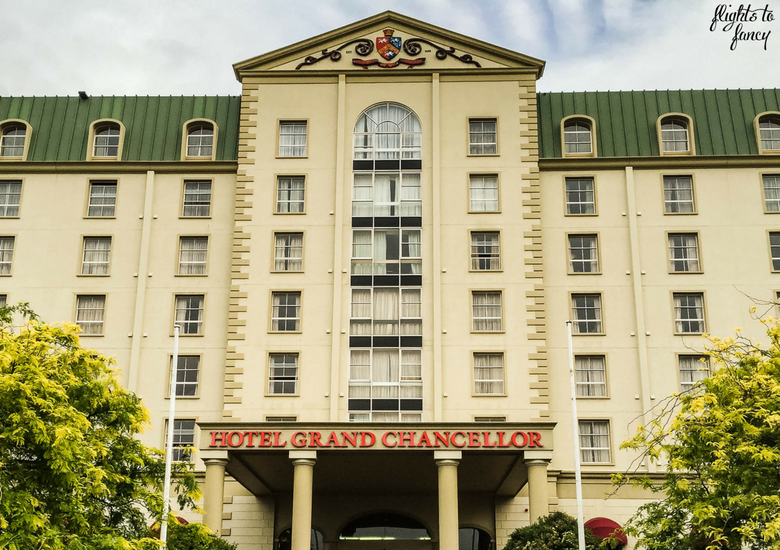 The Hotel Grand Chancellor Launceston has 165 rooms spread over seven floors. We booked through Agoda and paid $135 per night. 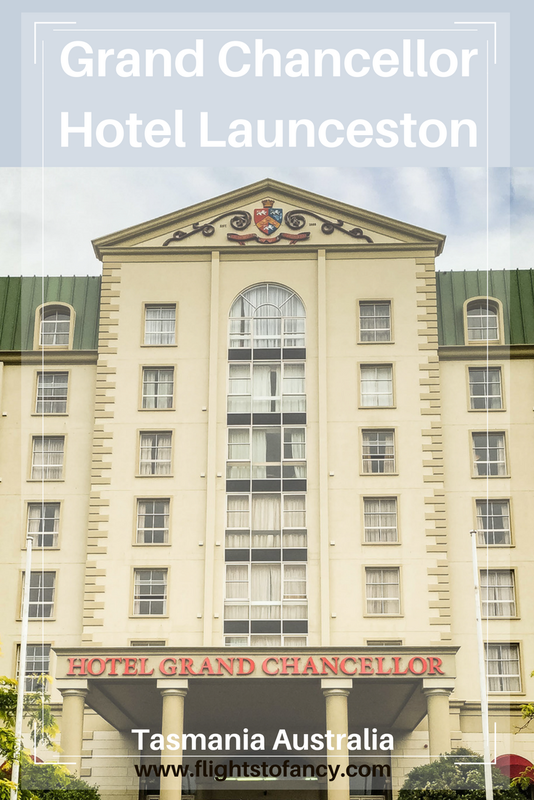 Accommodation in Launceston is on the pricey side and The Hotel Grand Chancellor Launceston compares very favorably to the competition. A hotel room should be welcoming and a delight to retreat to but on entering our deluxe king room the first thing I noticed was how gloomy it was. The king size bed dominated the space but the feel was institutional rather than inviting. While the linens were standard white hotel issue, there were only two pillows and none of the usual decorations such as runners, throws or cushions to add a touch of life. The generous sized robe did contain one extra pillow which I though was slightly odd. Were we supposed to fight over it? The mattress was comfortable and did deliver a sound nights sleep, which is the critical factor when judging any hotel bed. The ancient overhead lighting was woefully inadequate and the dark carpets, drab walls and uninspiring furnishings further exacerbated the situation. It took until our second night to finally discover the switch for the one down light in the room (behind the curtains of you are wondering) but it didn’t improve the situation greatly. The curtains themselves had certainly seen better days and pinpricks of light streamed through the multiple holes when drawn in daylight. Our room was quite spacious and the small lounge area was a welcome addition. This could have been a real wow point but the Hotel Grand Chancellor Launceston missed the mark. Instead of creating a pleasant space where guests could relax, the boring brown upholstery and too firm seats meant it was not conducive to lingering. The bathroom has clearly been updated but is an awkward layout with the toilet behind the door. There is definitely not enough room for two people to occupy the minimal floor space. The choice of peach, black and grey mottled counter tops is one I will never understand. The shower was above the bath and while the luxurious overhead waterfall spout will certainly appeal to most, I prefer to adjust the height and keep my hair dry. Luckily the shower cap supplied saved my sanity. The hot water was temperamental and I got scalded when a fellow guest chose to turn on the faucet. 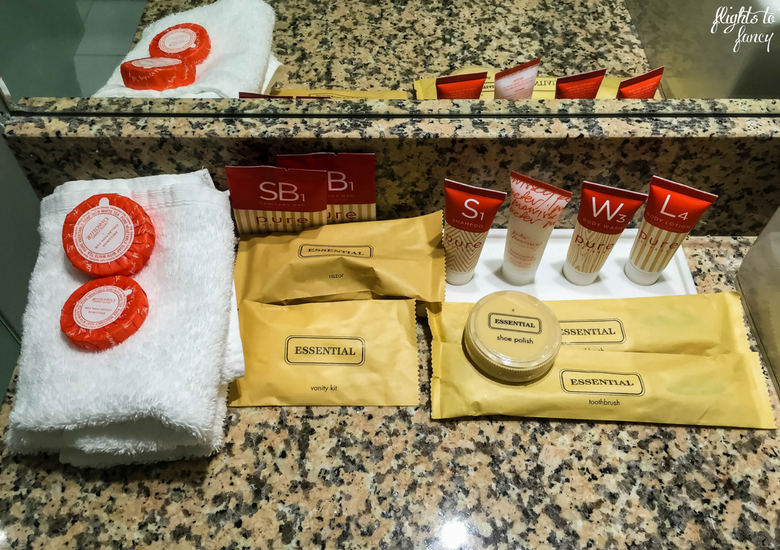 The lighting in the bathroom was a big improvement on the main room and the toiletries were thoughtfully stocked and even included shoe polish. Clearly the designers of the Hotel Grand Chancellor Launceston were more concerned with keeping guests warm than cool and the central heating is controlled from the bed side table. As an afterthought, a desk top fan and portable air conditioner have been added but even in the height of summer in mid-January we had no cause to use either. Those travelling on business should note that there is no separate desk but the TV cabinet does do double duty as lap top space. The fridge underneath was tiny and fitting a bottle of wine, water and a Coke all in at the same time was like playing Tetris. A central location was the key consideration in our search. We wanted to leave the car behind and explore Launceston on foot as much as possible. 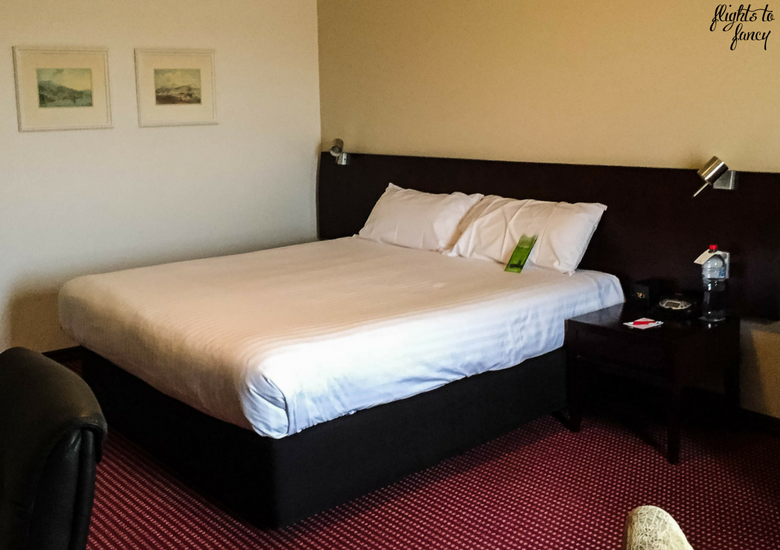 The Hotel Grand Chancellor Launceston occupies an enviable position on Cameron St in the heart of the CBD and is steps away from Launceston’s best restaurants. We had an amazing meal at the Black Cow Bistro and if you fancy Mexican, the Prickly Cactus is in the same area. City Park is a delightful place for a stroll and is only a block away. Boag’s Brewery and the Automobile Museum are both easily reached on foot as is Launceston’s shopping precinct. 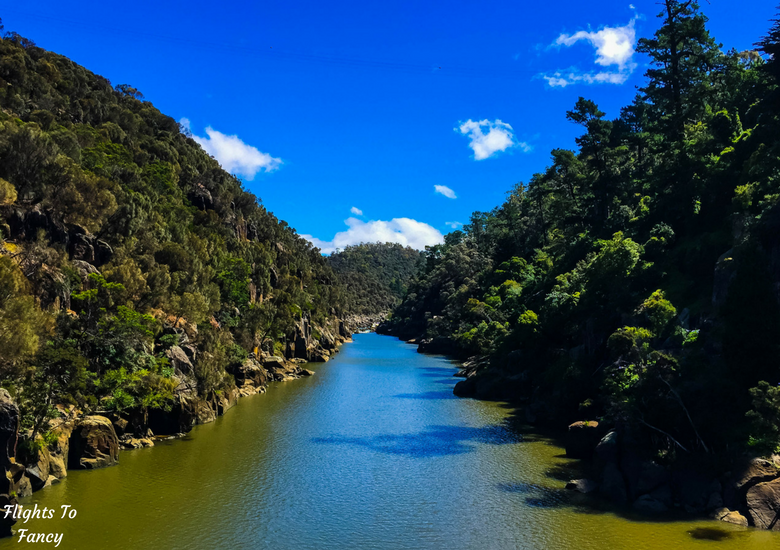 Cataract Gorge is a mere 15 minutes walk away and it still amazes me that such a natural wonder exists so close to a city! 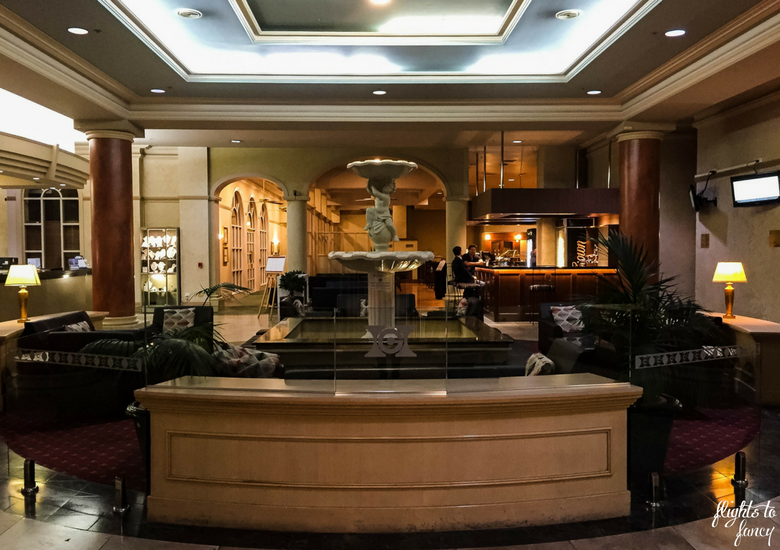 The lobby in the Hotel Grand Chancellor Launceston houses a restaurant and bar but there are very few other onsite facilities. There is no pool and guests wishing to use the gym are directed a few blocks away and slugged with a $15 charge. The parking was exceptional value at only $6 a night. The lot is open air but we certainly were not precious about parking our bargain hire car from Airport Rentals there. 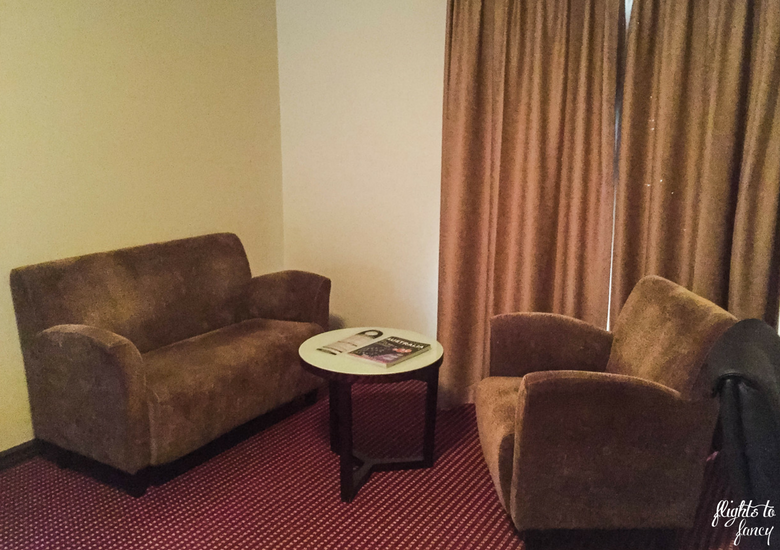 Rooms come equipped with Foxtel and wifi, both of which are free of charge which is always appreciated. 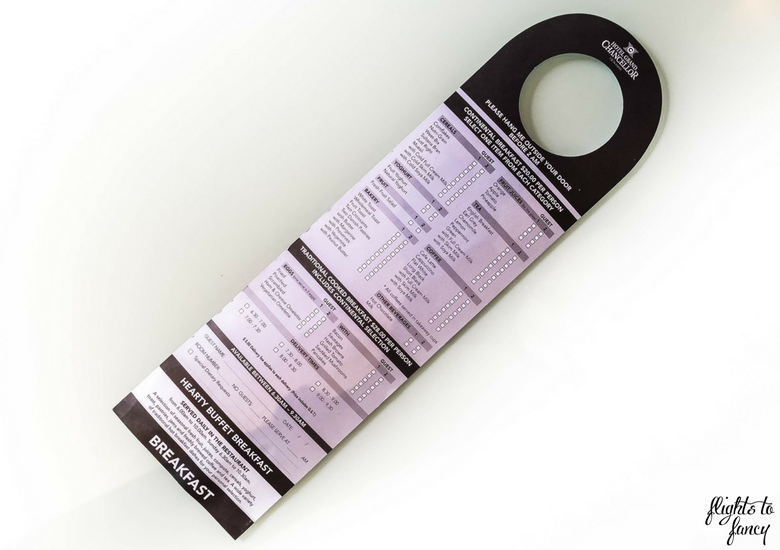 The breakfast menu is fairly standard and well priced, but we didn’t indulge. The Hotel Grand Chancellor Launceston has a number of umbrellas available for guests to borrow but on the day we needed one there was only one left and it was broken. We had little choice but to struggle with it anyway. We actually had very little interaction with the staff at The Hotel Grand Chancellor during our two night stay. Check in and checkout went smoothly and I was thrilled when my request for a late check out of 11am rather than 10am was approved as I never take this for granted. Even for just an extra hour! You can imagine my shock then when I received a rather rude phone call at 10.30 demanding we exit the building. When I explained we had arranged a late check the tone of the response made it clear they thought I was lying without going so far as to make a direct accusation. It left a sour taste in my mouth and we made a quick exit. Haggling over an extra half an hour simply wasn’t worth it. We were expecting big things after our wonderful stay at the Grand Chancellor Hobart but sadly we were disappointed overall with the Grand Chancellor Hotel Launceston. The high points were the location and value but the gloomy rooms, lack of facilities and hostile service did not deliver on what I have come to expect from a 4 ½ star hotel. If I am lucky enough to return to Launceston I will certainly look to stay elsewhere. Does the appearance of a hotel ever put you off staying on looks alone? I would love to hear your thoughts in the comments below. Disclaimer: This post is not sponsored. We paid for our stay at the Grand Chancellor Hotel Launceston in full and as always, all opinions are my own. 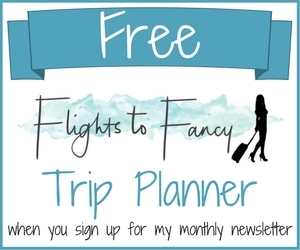 This post contains some affiliate links which will earn me a few cents to contribute to the running of this blog if you make a qualifying purchase. Sorry to hear that the Grand Chancellor missed the mark – it’s supposed to be a reputable hotel chain, but perhaps it’s becoming a bit stuffy with old age, in both interior decor and the staff members – how rude to accuse you of lying about a late checkout – I’ve worked in hotels in the past, and you always attribute this to the night person not leaving proper notes – never blame it on the guest! I’m surprised that they don’t have a gym onsite, and that they would charge for parking. I guess they figure that being in a great location means they don’t have to bring everything else up to par. Thanks for the honest review – we’ll be in Launceston next week, moving from the mainland, so will be sure to skip to the next hotel instead. I think with a room revamp, even just painting the walls, changing the curtains and livening up the bed, would go along way to lifting the atmosphere. The gym didn’t bother me as we walked for miles when exploring but I know it’s a deal breaker for some. I actually thought the parking charge was very reasonable compared to many city hotels so that was a plus in my book. It wouldn’t take much to breathe life back into this hotel. Exactly! We all have to make compromises. A little spruce up of the rooms would make a big difference! It’s always a bummer to have such high expectations of a hotel and then be sadly disappointed! While it sounds like it did not meet your expectations, it at least looked clean and okay for one night. Good thing you were able to have a delicious dinner, closeby. Appreciate your honesty! It was most definitely clean. No complaints there. It is quite typical of hotels in Launceston so in our price range it was the best option. The location was fantastic. Minutes walk to everywhere. A few changes to the room would have made a big difference. It sounds like the perfect word to sum this place up is “underwhelming”. It’s great that the room was clean and that you had a comfortable sleep – these are my two biggest criteria too – but it looks like there was so much missed opportunity for them to take it from ‘standard’ to ‘memorable’ – some extra pillows, some local art work. You have hit the nail in the head Vanessa. I expected more and it just didn’t measure up. It’s a shame because I’ve had good experiences with Grand Chancellor before. Though one doesn’t spend that much time at a hotel, it helps to have a place that’s welcoming and cozy to return to at the end of a busy day. This one has rather uninspired interiors. The re really do. So easy to fix! A coat of paint would have made a big difference. I love when hotels give you more toiletries than you know what to do with. We usually try and pick hotels that carry vegan products or bring our own though. This looks like a lovely hotel. This hotel is exceptional, Allison! I really enjoyed reading your awesome review! It is when it works out Genie! This time it went a little pear shaped! I wonder if your initial reaction to the exterior influenced your view of the interior. Although, two pillows and one extra could be a bit of a problem, its the low lighting that would have really annoyed me the most. Glad you found a good meal nearby. It was more stepping into the room Rhonda. I was actually happy with the exterior and the reception. The room was just ver underwhelming. It’s just a shame as most things could have been an easy fix! This looks like a great place to stay, but the picture that really has my attention is the Black Cow Bistro. I want that steak! Thanks for the review. 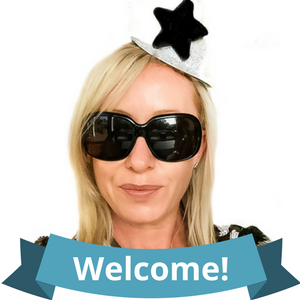 A few small changes could have made a world of difference Stacy! The Black Cow was sensational! You must go! This hotel looks totally amazing and reminds me of the stately homes which are hotels here in my home country, the UK. Loving the honesty of your review. Great post. Glad the hotel appeals to you Danik and yes it would be right at home in the U.K.! Too bad about your experience. It did look rather drab. The meat you pictured looked like the best part of your stay! It was dean Kate but it could have been worse. It was clean and the bed was comfy which are very important. The Black Cow was sensational. 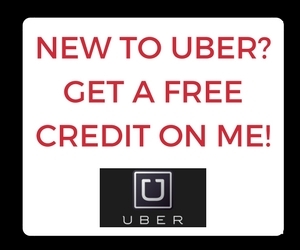 I hope you get to try it out one day ? Design means everything to me as well as atmosphere and this hotel lacked both. I love minimalistic places and would rather opt for such a place than something like that. Minimalist is my thing to Hannah. Very hard to find in Lonnie without breaking the bank and staying close to town. The Grand Chancellor still wins on value and location! The location looks fantastic. The rooms don’t appear to be as frou frou as I’d expect from a heritage hotel at least not as much as the lobby. I don’t like traditional hotels with heavy furniture and too many knick-knacks. It makes me feel claustrophobic. The room was just uninspired. A little attention to detail would go a long way. What a pity that the hotel didn’t meet your expectations. It’s always quite an annoyed feeling especially when you have to pay quite a bit and it’s relatively small things they could be doing differently! Thank goodness is was in a great central area so you could still have a good time! It was disappointing Carlinn but you can’t win them all! The value and location was the reason I chose it and it those areas they excelled. The lobby and facade of the hotel both look lovely so it’s such a shame that the room didn’t meet your expectations! There’s nothing worse than having to go back to a gloomy room after a day of exploring. 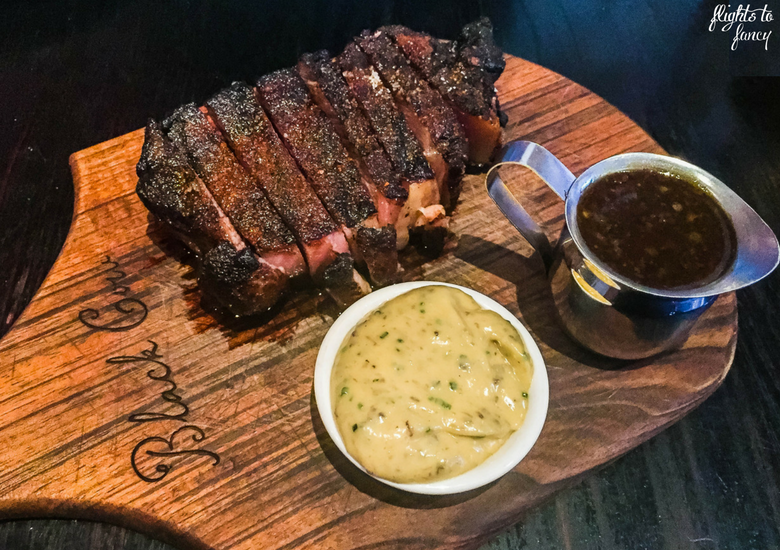 That meal from the Black Cow looks delicious though! I know right David! A refresh of the rooms would make a big difference. The Black Cow was sensational! I am sorry you had such an unpleasant experience with Hotel Grand Chancellor. I am definitely affected by the appearance of any accommodation. When you aren’t satisfied with your hotel, it definitely can leave a bad taste in your mouth. On the plus side, it’s nice that it was central Launceston, but a nicer accommodation would have been nice! It hard not to be swayed by the appearance Riely. First impressions really count. The location couldn’t be beat though. I loved being in the heart of everything! So sorry to hear your stay there was so crummy. The room definitely looked old and ancient and it seems like it would smell moldy too. For a 4 1/2 star hotel you would expect the staff to be more attentive. On the bright side, you got to check out an hour later! It wasn’t smelly Gina. I think that would have been the final straw! Well the check out didn’t go exactly as planned but what can you do. After approving the 11 AM checkout and then changing it would have been something that I would be pissed out about. It is definitely not expected of a 4 1/2 star hotel. I write about both my pleasant as well as my non-pleasant hotel experiences. That is why I liked your honest review about a place you didn’t like. It was annoying Soumya but I was more annoyed by the tone which suggested that I was lying. It wasn’t worth arguing over the extra hour though. The little things make a big difference to the overall experience. So true Danijela. It all comes down to individual opinions! And yes The Black Cow was amazing! Its great to see such a honest and straight forward review. I had a similar experience with a hotel last year when I stayed in Mahabalipuram, India. But I never thought of taking the efforts to pen it down. I guess I should. Thanks Neha. My reviews will also be honest! It’s just how I roll ? Kudos for the honest review. Though the looks of the hotel are a bit gloomy and the absence of many facilities, but the location turns out to be a plus point. All the positivity during a hotel stay comes from the hotel staff and the interaction, but too bad you had quite a wonky experience. Have experienced something similar too, where the location was good, amenities not that much but the thing which put me down was the bitterness in staff interaction. It was probably most disappointing that our very last experience (check out) sticks in the mind and overrides all others. Yes the location was fabulous and that was an highlight. I love heritage hotels. This one sure has a great location and old world charm. But yes, these hotels need to get the right blend of vintage charm and modern convenience to ensure a great experience. The Grand Chancellor would be right up your alley than Sandy! It’s a shame the facilities failed to live up to your expectations. It’s never fun when you are disappointed with the place you’re staying. I’ll admit that aesthetics of hotels do influence my decision to stay, not entirely, but it plays a large part. Thanks for sharing your honest review. It’s hard not to be influenced Gemma. Such a shame as a few small changes could make the world of difference. It wasn’t really empty Umberta but yes it certainly was dark. The combination of little natural light and inadequate overhead lighting wasn’t great. Agree location and a comfy bed were spot on and I couldn’t fault them on that! Bummer that the hotel didn’t live up to expectations. Hotels are supposed to be home when you are on the road, and poor service can really sour a trip. That food from the Black Cow looks amazing though! I know right John! Hopefully a room revamp is in the cards. Black Cow was amazing! Oh, as my tween daughter would say, “Sad face”. The bedroom certain is minimalistic in decor. I”m sorry that you had a less than fantastic time. Reading reviews really helps a traveler make educated decisions about where to stay. Sad face indeed Natalie! Such a shame as a few changes would have lifted the whole experience! There was a fan Natasha but we didn’t need to use it as the wether was quite cool when we visited! Thanks for your honest review of this hotel. I definitely agree with you that the appearance of the hotel has an effect on my overall perception and I tend to prefer more modern, minimalist and light-filled spaces. Me too Steph. I was hoping for the best but was let down.